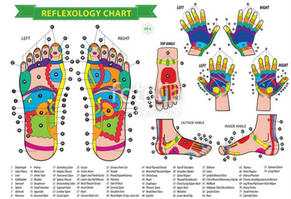 Reflexology is a wellness treatment where the therapist works on reflex points on your feet, hands, and ears. that relate to specific organs and glands in the body. Stimulating those points with finger pressure promotes health in those organs and glands via the body’s energetic pathways. Reflexology is a deeply relaxing treatment with benefits that can be felt throughout the body. The therapist will use various techniques that include holds, finger pressure, kneading, rotation and rubbing.